Bernanke’s gentle mea culpas had us wondering what kind of confessions we may hear next. It’s probably not surprising that we didn’t have to wait long for clues. 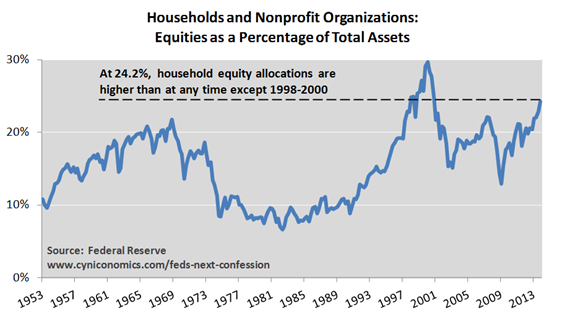 As shown, the aggregate equity allocation for U.S. households is now at a level that’s only ever been reached in the Internet bubble years of 1998 to 2000. This will surely lift spirits at the next FOMC meeting. (Cue the laugh track.) Higher equity allocations are exactly what the Fed tries to achieve with its so-called portfolio balance channel – their jargon for driving up the prices of a few assets by enough that you push investors into other assets (risky assets, such as equity, in the present case). It doesn’t seem like such a good result to us, though. As we discussed here and here, there are a variety of indicators linking today’s S&P 500 valuation to at least the middle stages of the Internet bubble. Now the household balance sheet puts us right back in, well, the middle stages of the Internet bubble. What could possibly go wrong? Unfortunately, such reflection – whether by Bernanke or his former colleagues still at the Fed – only extends so far. The Fed’s basic beliefs and workings are clearly sacrosanct, no matter how many times they fail. And as long as that continues to be the case, expect current and future Fed Chairs to follow Bernanke’s lead and draw up a list of boom-bust blunders shortly after leaving office. They can then offer a first-hand reading sponsored by large financial institutions at $250,000 a pop. It’s nice work if you can get it.